I need to turn up the audio in a video that is too low. I can hardly hear it clearly. Should I re-record it to a new file or need some software, tip or trick that can increase sound volume? I am urgent to improve it because I have a family party in the evening tomorrow. Thanks. As a matter of fact, we more or less have files that even when the volume is set to the highest level, the audio in them sounds rather low. This will make us feel frustrated especially when we’ve got everything ready for the family movie time. If you’re struggling to ask for tools to increase audio volume from the Internet, here’re suggestions that would help you find out the most appropriate one. Whether you are a Windows or Mac user, Video Grabber should be a best free volume increaser in boosting video volume on the web by 200%, 300%, 400% and 500% of the original volume. In fact, it is usually taken as a video downloader for file grabbing from the Internet but the well-designed basic editing feature in its “Convert Video” tab won’t feel like an afterthought if you look further into it. Let’s focus on how it increases sound volume. Access its official webpage at first and press “Convert Video” tab. Follow the page instruction to download the Launcher. Click “Select files to start” to import the file you need to adjust volume. Hit “Edit” icon and go to find “Adjust Volume” option from which to choose the one you’ll use. Click “OK” and select an output format for the video, such as “MP4”. Press “Convert” to create the new file that has louder volume. Notice: The launcher is completely clean and safe to our computer and personal files. It won’t hurt your computer. The role it plays is to start the online app. No membership or charge required. Grabs online videos with advanced search engine. Supports to convert any file into different file types. Provides basic video editing features to use freely. Features a screen recorder to screencast video or audio on the screen. Video Converter Studio is a desktop audio volume increaser for PC users. Though it is implied to be a converting program, it offers more flexible and convenient ways to enhance sound volume than online apps. Users are supposed to drag the volume slider to make the sound louder while checking the adjustment. There is a media player built in the window which makes it intuitive to know how the edited video will be. Come to get the skills to increase audio volume with it. Download the software from below button and install it well on your computer. Run the program, open files by dragging and dropping files or through the “Add files” button. Hit “Edit” > “Effect”, under the tab, you can move up or down the volume to any extent you can bear. Click “OK” if you think the sound is okay with you and select a proper format to save the file as a new one. Press “Convert” to make all changes you set work. Tips: You must have seen the up and down arrow next to the Volume bar. They are available to let you change the volume gradually. Converts any audio and video files to other formats and devices at high speed. 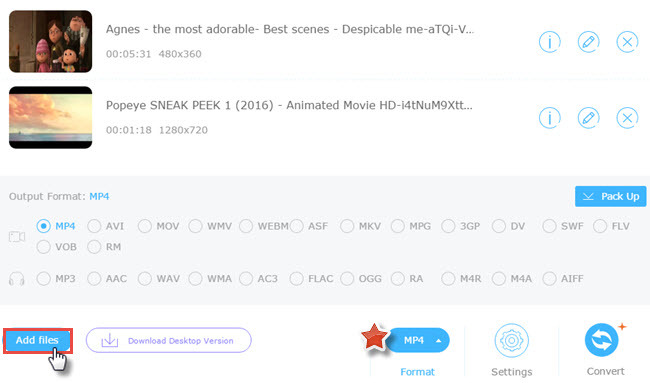 Supports to download files from 10,000+ video sites in different resolution you need. Provides flexible video editing features to make your videos Hollywood-like. Available for recording screen activities any time you want in different mode. Helps to create vivid music video with pictures and favorite music. Offers a flawless playback experience to nearly all kinds of media files. ApowerEdit is a professional media file editing program that allows users to edit media files including image, music and video. 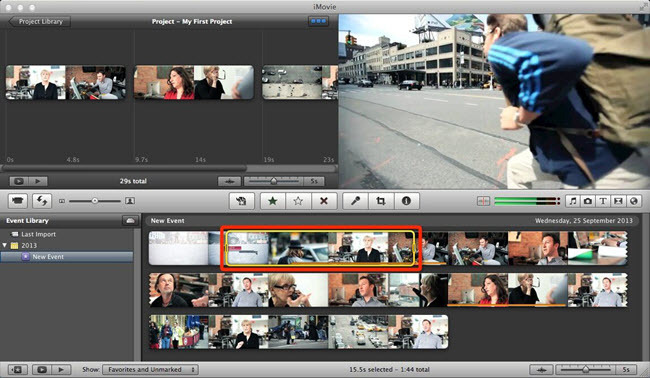 It offers multiple editing options like trimming, cropping, adding effects, transitions and many more. Therefore, this application is absolutely eligible to increase volume of video files. Furthermore, when you have completed editing, you can export the project to video and certain devices including iPhone and Android. It’s rather simple to use the program, you may refer to the instructions below. Click the button below to download and install the program on your computer. Launch the program and then add video file. Right click the video and then choose “Add to Project”. Double click the timeline and then adjust Volume in the tab of “Audio”. Click “OK” to confirm changes and then go to “Export” > “Export video”. Provides various editing options of Transitions, Layouts, Text and Filters. Allows users to customize editing effects based on their preferences. 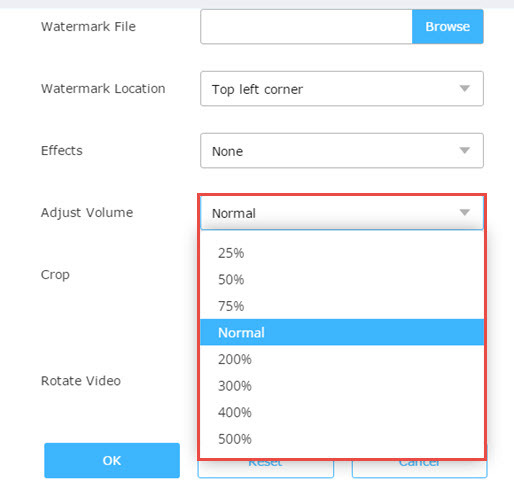 Empowers users to define resolution, bitrate, framerate, etc. Apple’s Macintosh is a closed system. The good-to-use audio volume increasers are far fewer than that on Windows. iMovie, the natively developed Mac app is one of tools that can be made the most of to adjust volume. Actually, there are four ways to change the level of volume according to the Help Center. 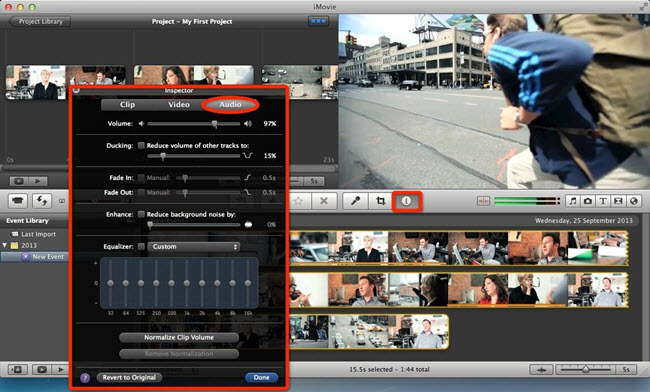 The below comes the easiest way to increase sound volume with iMovie. Drag your file to iMovie Timeline section before you proceed with the next step. 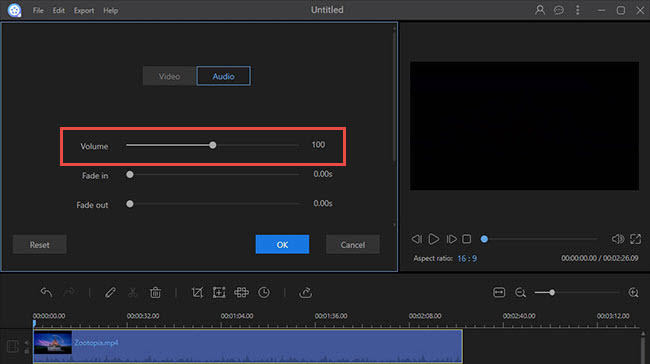 Move the pointer over a video clip with audio to select the part you want to boost the sound level. Open the Audio Inspector and drag the volume slider left or right decrease or to increase clip volume. Click “Done” to save the changes and export the edited file as usual. Note: The change will be applied in any future clips you add to iMovie. 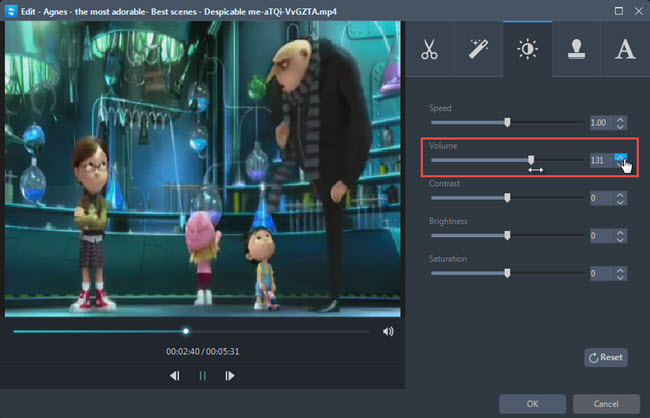 Tick “Revert to Original” in the Audio Inspector that opens to remove the adjustments. Supports to create beautiful movies and trailers at stunning 4k resolution. Manage the photos and pictures on your Mac with a side-by-side layout. Provides an easier way than ever to share your movie to the crowd. Find this guide helpful to you? Tell us which one you like the most or if you have better ideas regarding this topic, let us know. We’ll be happy to add it to make more people know about it. What happened to movie2k, any sites like movie2k?